As the sunshine only makes fleeting appearances here in the UK and I'm not venturing abroad this summer, my skin is looking more like milk than caramel. Although it's cloudy, I want to make the most of the warmer weather and don't want to be wrapped up in layers of clothes to hide my pale pins. If I'm caught short with last-minute plans and haven't had time to whack on a full-body, self-tan application, instant is the answer. I've tested out a fair few formulas and thought I'd share with you a couple of absolute gems and a few to maybe avoid. Sally Hansen's Airbrush Legs Leg Makeup gives you more than just a faux-glow; this is flawless skin in a tube. After using the spray-on formula for years, I've discovered the cream version, which is a better option when living in an apartment full of pale carpets. Scrap the idea that it's a leg-only product, as it's great for the whole body. Rather than simply adding a tint of colour, this makeup provides a heap of coverage. Masking a whole host of imperfections, including bruises, scars and veins, it's a full-on product. Even Kim Kardashian-West is said to use it to camouflage her psoriasis. As the coverage can completely disguise the skin, the colour can look slightly orange on fair skin-tones. Personally, I use both the light and medium shades, using the lighter most often and the darker when I've previously fake-tanned. Smooth and creamy, the formula spreads easily and absorbs quickly. But, it's important to let the makeup dry fully before getting dressed to ensure the colour doesn't transfer. Although it's always obvious that the skin has been enhanced somewhat when using Airbrush Legs, the result can be surprisingly natural if you don't go overboard. Water-resistant, the long-lasting formula refuses to budge once set; even if I get caught in the rain it resists the urge to trickle off. That amazing longevity is a god-send during that special event or night out, but boy does it hold on for dear life when you try to remove it. If there was one thing I could change about the formula, it would be the paint-like scent of it that continues to linger after application. Fortunately, it's easily masked with a generous dose of perfume. 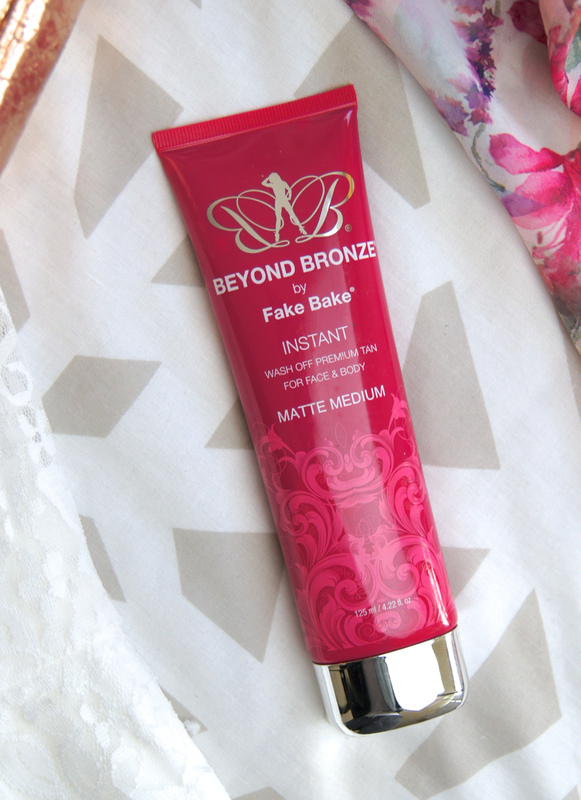 More of a gel texture, the Fake Bake Beyond Bronze Instant Wash-Off Tan resembles treacle when you first squeeze it out. Despite looking rather scary to begin with, it blends out into a soft colour that's surprisingly subtle. There's no risk of being mistaken for an oompah-loompah when using this product, as it has more of a flattering, olive undertone. Although the shade I have is medium, the colour is still very light, so this is a great choice for anyone that wants a believably natural result. Rather than leaving a powdery coating on the skin, it creates more of a stain of colour. As the formula is so light and hydrating, it doesn't cling to any dry areas of skin or hairs, so the finish is very smooth and flattering, even in harsh sunlight. Whilst the colour and finish are lovely, the application process is where this formula falls short. Needing a little more work than the others, Fake Bake's product needs to be carefully, but quickly, blended to avoid streaks and tide lines. Once applied, the tan stays feeling tacky for a while, which is a pain when you're in a hurry. Post application, hands are left a delicious shade of mahogany, which doesn't completely wash off straight away, either. As a result, I have to either sucker my boyfriend into applying it for me, or use a tanning mitt. The fresh, floral scent makes the application process slightly more bearable, though. 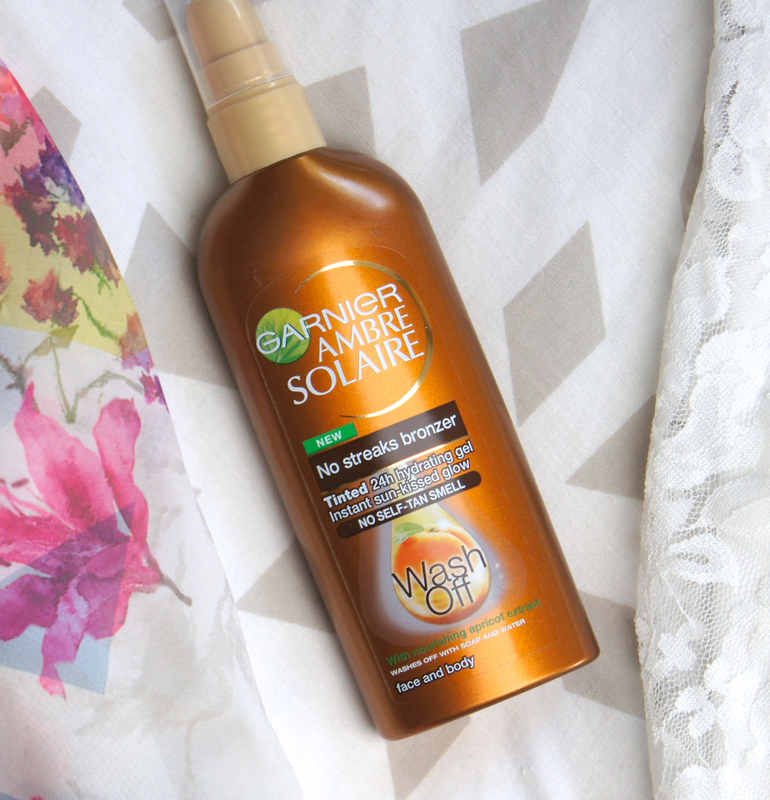 Another formula with a light, gel consistency, is the Garnier Ambre Solaire Wash-Off No Streaks Bronzer. Cleverly, Garnier have added a pump to their packaging, which makes application so fuss-free. As squeezing out too much product is impossible, waste and mess are kept to a minimum and any travel bag leakages are less likely. Enriched with apricot extract, the formula is not only moisturising, but also smells lovely and fruity. Thanks to the thick, hydrating formula, this tan spreads easily and doesn't dry too quickly, providing ample time to thoroughly rub it in and make sure it's even. There's no need to worry about the colour clinging to dry elbows or knees, either. Just as Garnier claim, I've never been left looking streaky or patchy after using this. I bet I could achieve a flawless finish with my eyes closed, I'm that confident. Even though Garnier's instant version only comes in one shade, it has a slight, red undertone to it and isn't as orange as others, making it a great choice for fooling people into thinking you've just spent a week in sunnier climes. Easy to remove, you don't need to scrub yourself red raw in the shower the next day to wash the tan off, but any drink spillages will cause it to go patchy, if you aren't careful. Other than that, I think this instant tan is pretty much faultless and it's definitely my top choice out of this bunch. 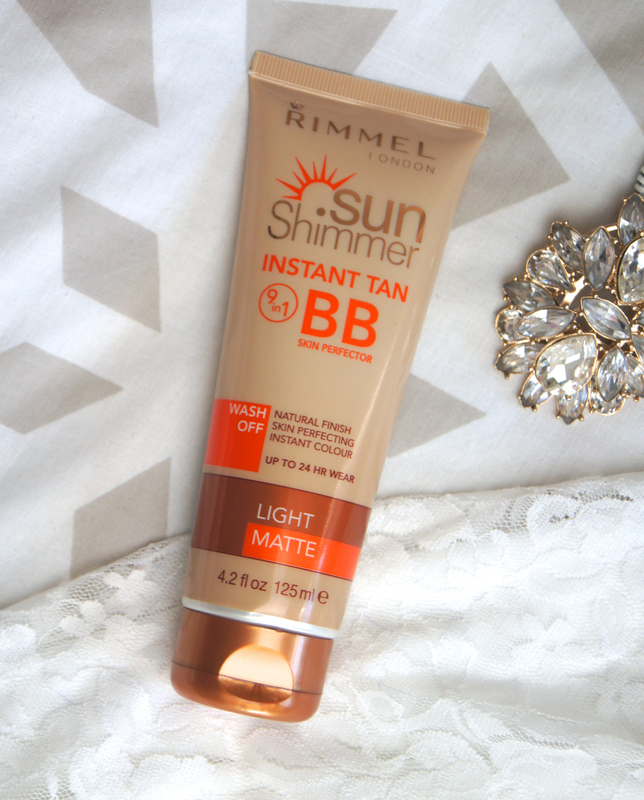 Similar to Sally Hansen's cult-favourite tan mentioned above, Rimmel's Sun Shimmer Instant Tan BB Perfector is a less intense alternative. Rimmel claim that this is a 9-in-1 product, but realistically, it doesn't do much more than the others. Acting as a tinted moisturiser for the body, this formula provides some coverage along with a hint of colour, but it's sheer and doesn't totally blank out the skin. Any darker marks aren't hidden, but it's great for gently evening out the complexion and toning down any redness or discoloration. Being thick and creamy, the formula feels nourishing and leaves skin soft, but it starts to dry and becomes hard to blend fairly quickly. Working in small areas at a time is best, when applying and don't be scared to use a bit more product than you usually would, as it makes the process a lot easier. The light shade has quite a yellow-based undertone to it, instead of being too pink-toned or orange, so the colour is very soft and perfect for a tanning newbie. The medium and dark shades have a significantly terra-cotta hue to them, so I steer clear of those, but they'd suit anyone with a darker skin-tone. Like the original Sun Shimmer products, the BB Perfector has that classic, instantly recognizable scent that brings back memories of University partying, for me. Ironically, it's quite a floral, powdery fragrance, which has a stereotypical grandma vibe to it. Nothing a spritz of perfume can't solve, unless you like that kind of fragrance, of course! 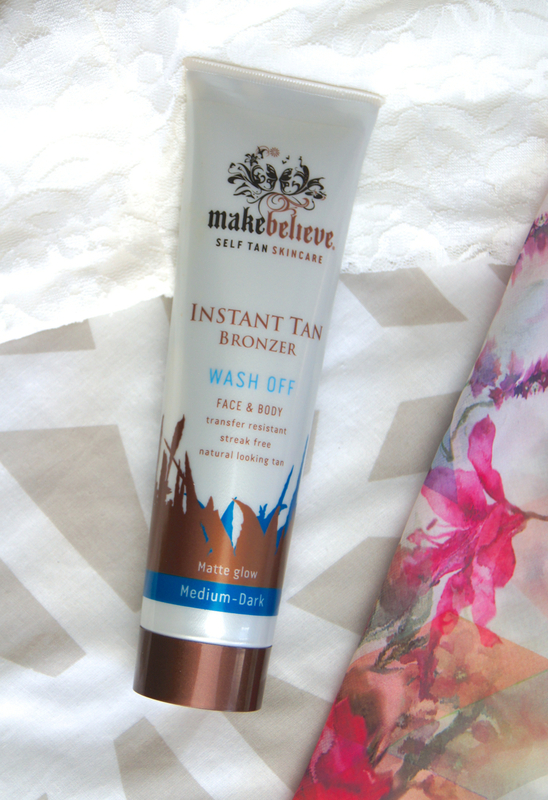 Like the Fake Bake tan, the Make Believe Instant Tan Wash-Off Bronzer (discontinued) is also a very dark gel. Having more of a thin, liquid consistency, compared to the others, it can be difficult to blend evenly. As soon as you take your eye off the ball or miss a bit, you're left covered in streaks and, as it dries straight away after applying, that bad job is impossible to rectify. You must use a mitt with this for the best finish, basically. Whilst the formula isn't actively moisturising, it isn't drying, either. It can emphasize the look of dry patches if you haven't exfoliated well before use, though. I accidentally picked up the medium-dark shade when I bought this tan and I'd normally always stick to the lightest colour available, to be on the safe side. Fortunately, it was a nice surprise to find that the colour is actually rather light and natural-looking for my fairer skin. Rather than being overly orange or muddy, it has more of a real tan look. From my experience, the tan doesn't transfer onto clothes, but any contact with water makes it go very patchy, in an instant. Fragrance-free, there's no off-putting scent to worry about when applying or that will sneakily develop after an hour. 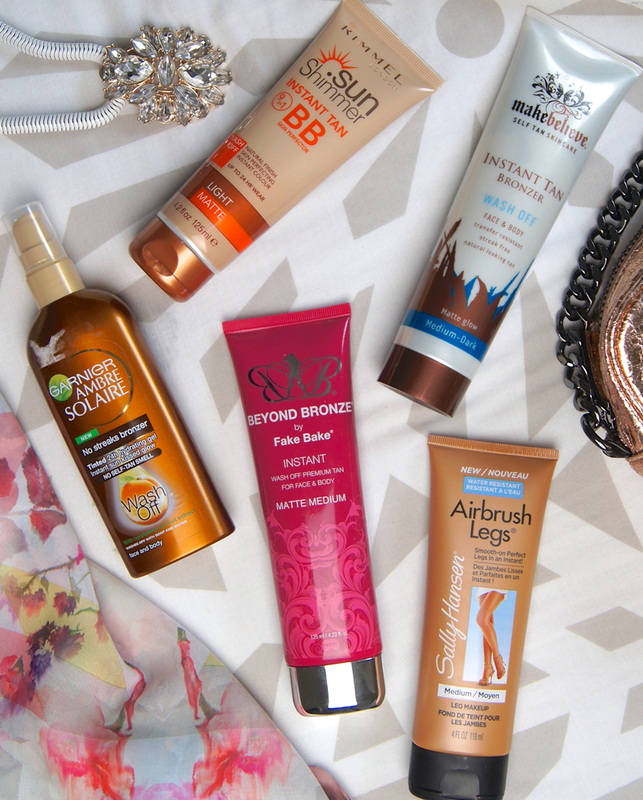 Do you like to use instant bronze formulas to amp up your tan? i love the sally hansen airbrush legs! I used it so much in summer to give my legs a quick 'flawless' look! it's great!